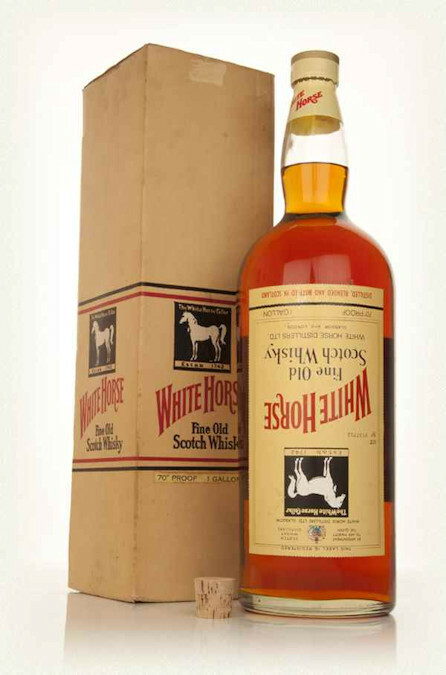 This White Horse Blended whisky is a member of the Diageo range and contains around 40% malt whisky and was bottled in the 1970's and is 4.5 litres in size. With this bottle over 40 years old, the price is heading towards £1,000 and is a rare bottle to get your hands on. The malt that is used the most in the White Horse range is the Lagavulin Single Malt from Islay. When you drink this fine blend you can taste honey and a kind of peaty taste. It also has a smooth and distinctive taste which you will always remember. There are three main factors for the taste of White Horse Blended Whisky are they are the top quality grain, clean malt that is used and peat the water filters through. Also the salty sea air where Lagavulin is made gives White Horse unique taste that no other blend has. Caol Ila is also included within this blended whisky I would stay this is an outstanding blend that that can be underrated. Some people say it is 'a poor man Islay', but I disagree with this statement and it is a bargain at the price it comes at when you look at the expensive Islay pure malts. An interesting fact with White Horse Whisky is that it was the first bottle to have a screw cap instead of the cork and when they introduced the sales basically double. The name White Horse comes from The White Horse Cellar Inn in Edinburgh that was famous there in the 1700's. White Horse Blended whisky has been around since 1890 and was blended first by Peter Mackie who simply wanted to make the finest whisky possible and made White Horse the blended whiskies we have today and being exported from Scotland to over 200 countries worldwide.